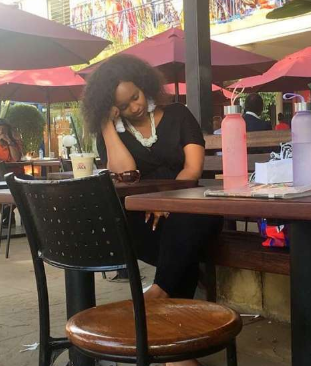 Kenyans On Twitter (KOT) have gone ham on Media Personality Grace Msalame after she was spotted taking a nap in public at a popular restarant. Immediately the photo hit online, Kenyans turned it into a meme, sharing funny stories how sleep has always derailed them. It seems the mother of two was extremely sleepy and decided to take a powernap something that Kenyans quickly turned into a joke. Me at 5AM: "Good things come to those who grind"
Her : (on phone) Aiiiiii babe , we were meeting for coffee today ?! !